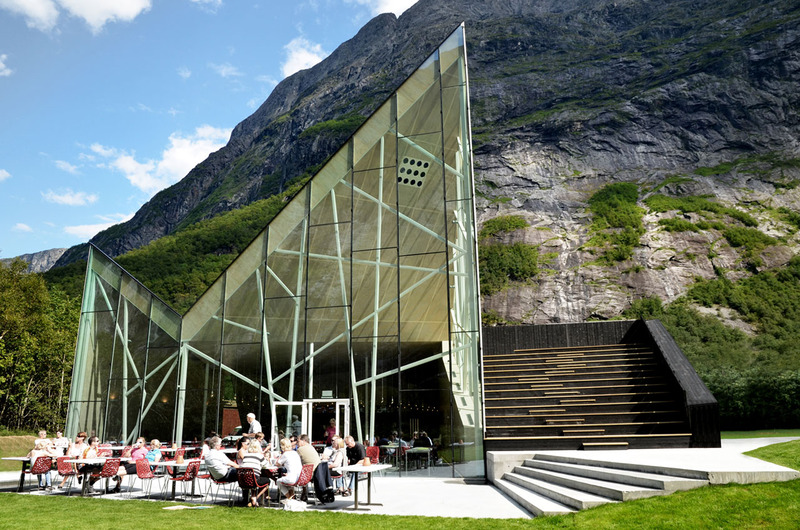 The Trollveggen made Architectural Digest's list of 10 most beautifully designed restaurants – read more about the visitor center and cafeteria elevated by its modernist architechture. 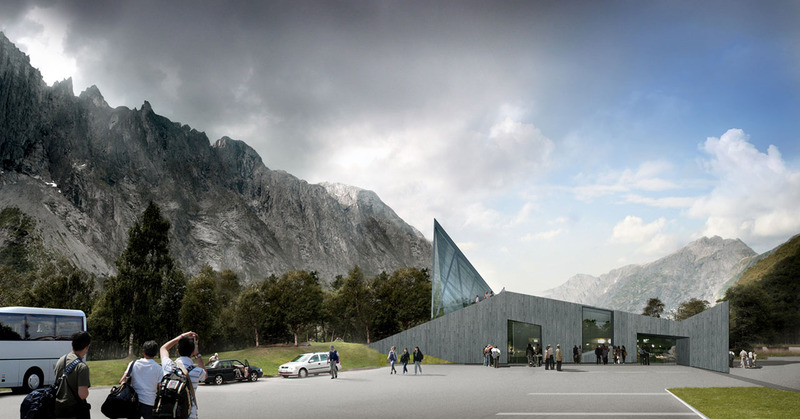 Reiulf Ramstad Architects designed a new tourist center and restaurant at the base of the Troll Wall, Europe’s tallest rock face. 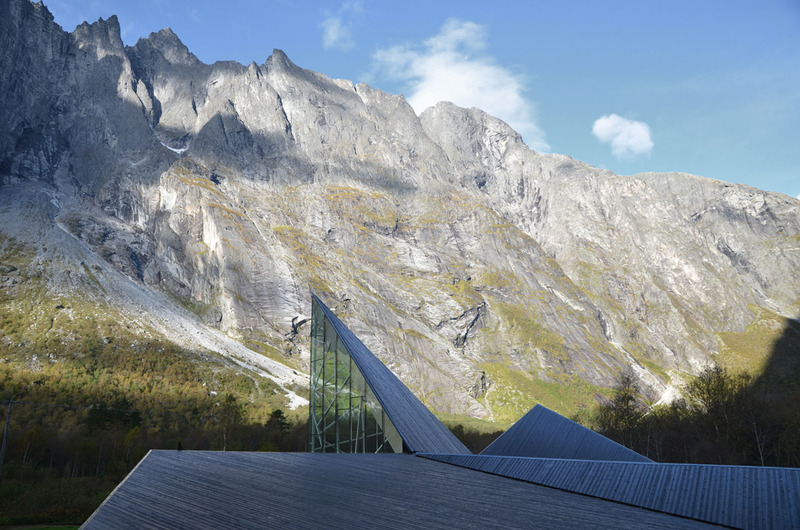 The form and material palette of the center mimics its stark landscape, and the resulting design is so dynamic it just might steal the show. 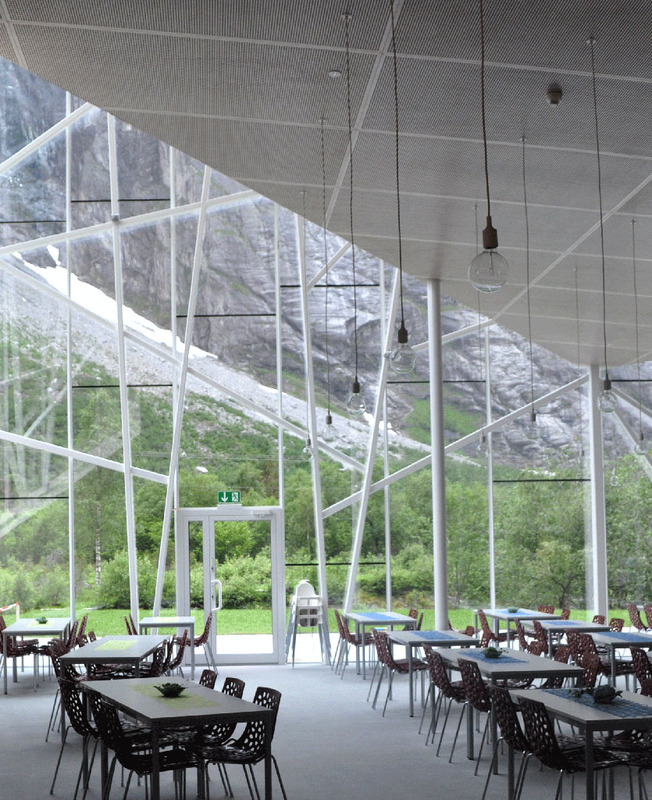 Tourist centers with restaurants are necessary and inevitable fixtures along scenic roadways. 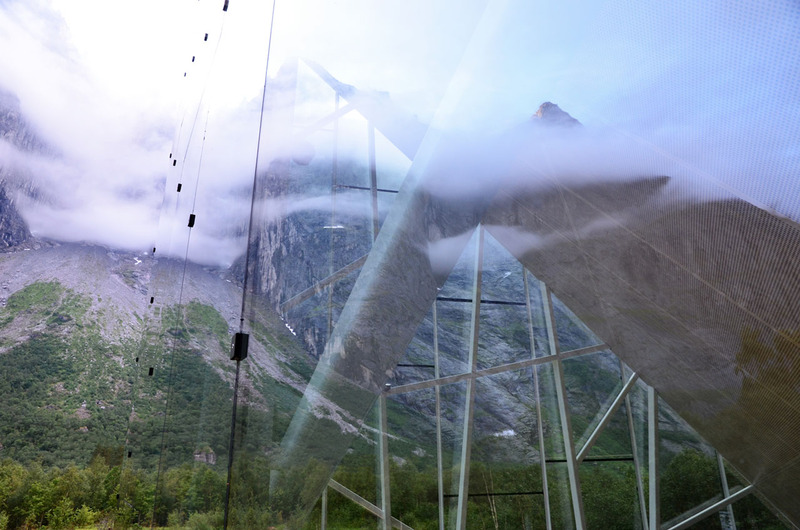 Usually they are utilitarian structures that peddle gaudy souvenirs and greasy food. 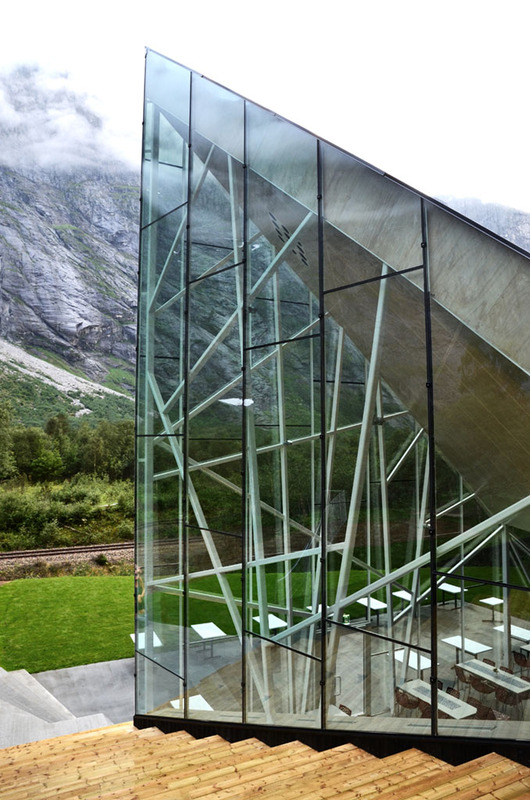 However, in Norway, road-trippers have a more modern and elegant option when it comes time to make a pit-stop. 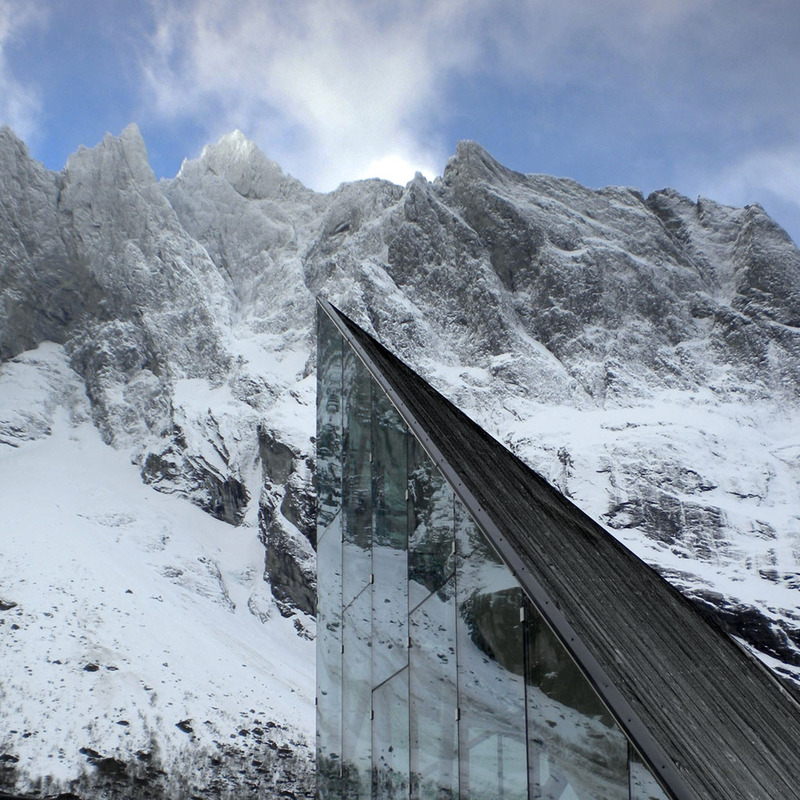 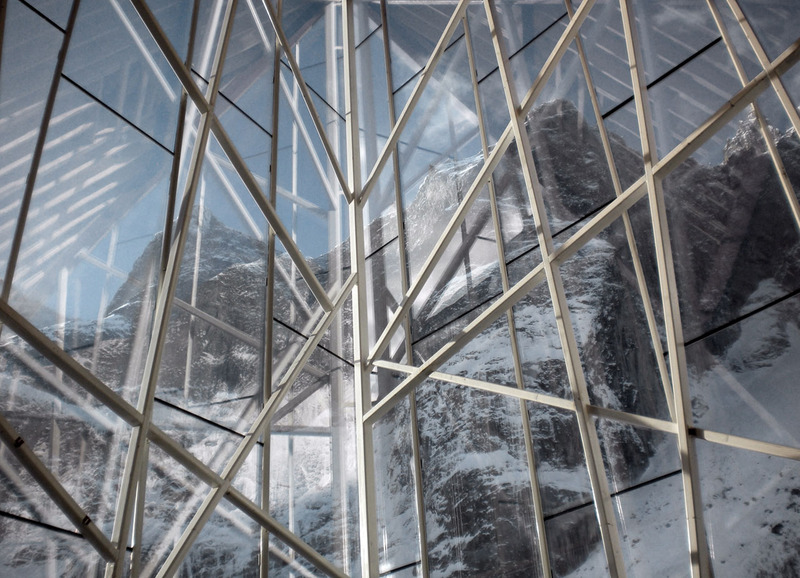 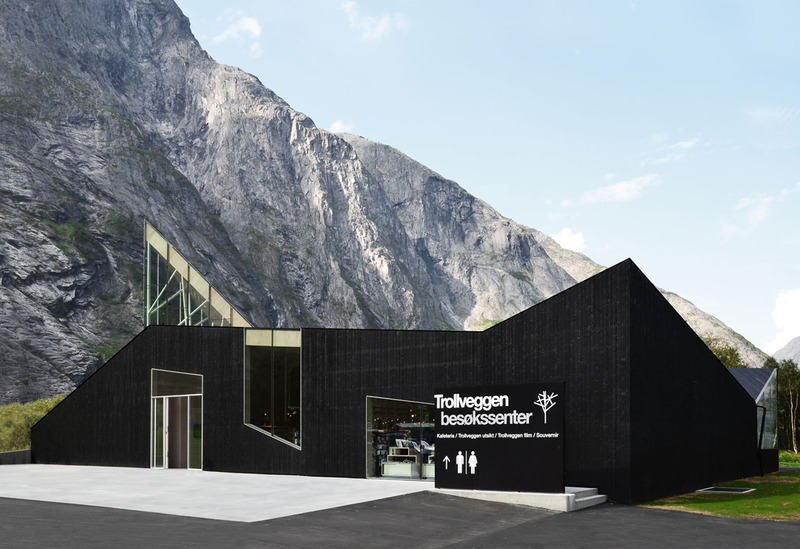 The new tourist center situated at the base of Norway’s Troll Wall, or Trollveggen—Europe’s tallest vertical rock face, located in the Romsdal Valley along the western side of the country—is a welcome exception to this tired typology. 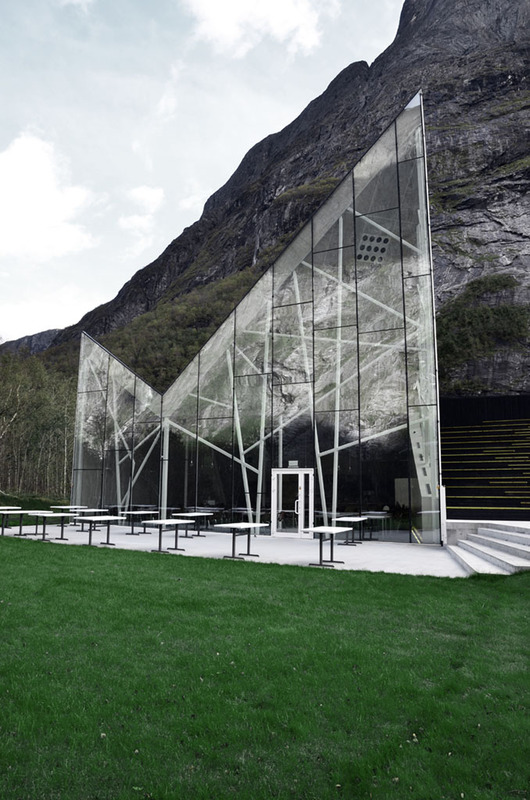 The program of the tourist center includes a restaurant with indoor and outdoor seating, a gift shop, and a movie theater, and it will be open seasonally from June to September. 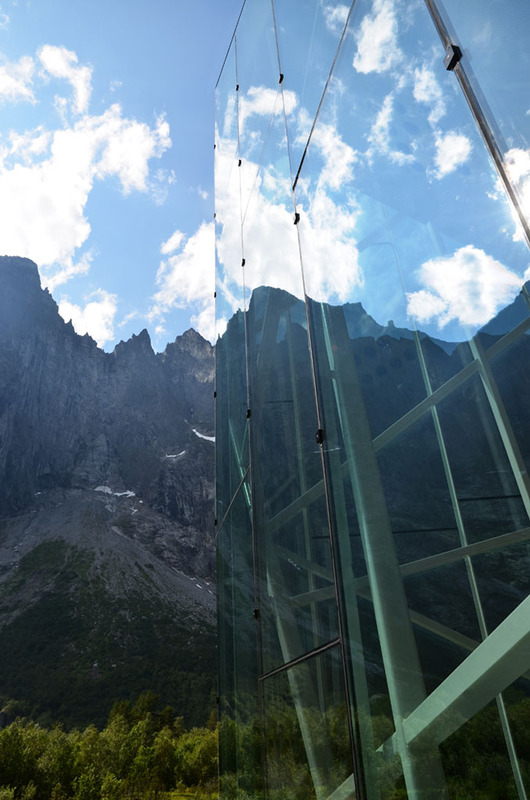 The center is sited beneath the iconic Troll Wall, which rises 5,600' to its summit, overhanging its base by 160'. 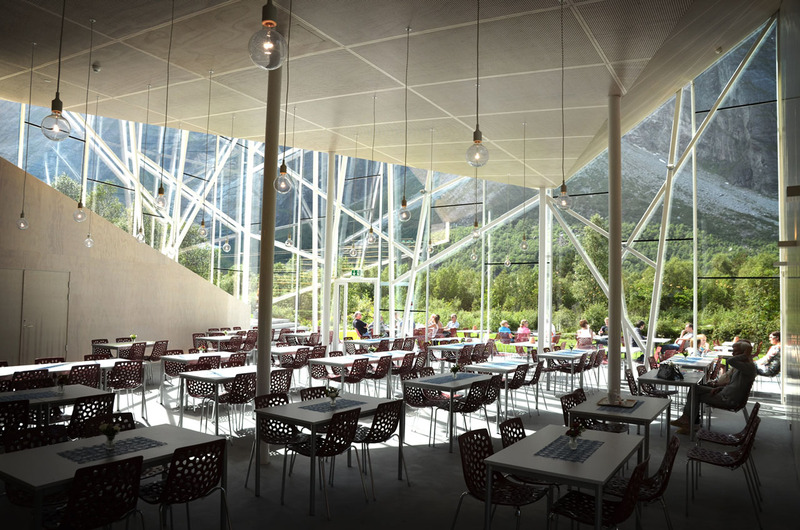 The designers incorporated outdoor amphitheater-style seating so spectators can enjoy the view, listen to concerts, and watch parachute jump events, including “birdmen” in winged suits. 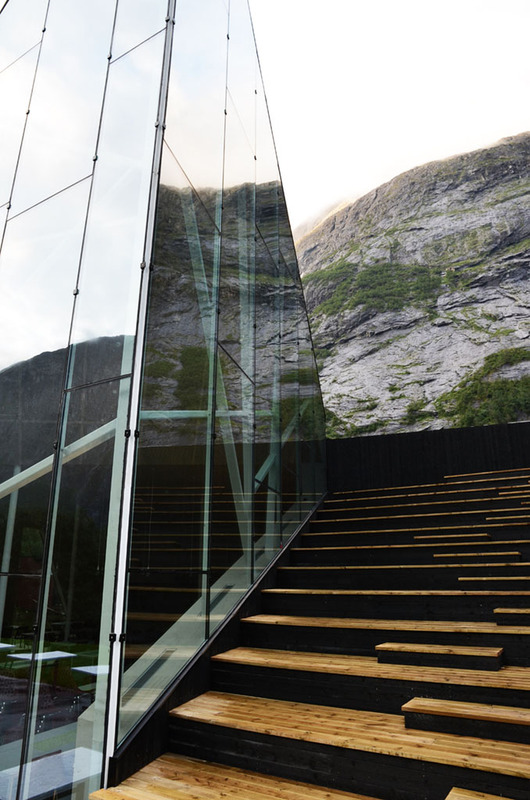 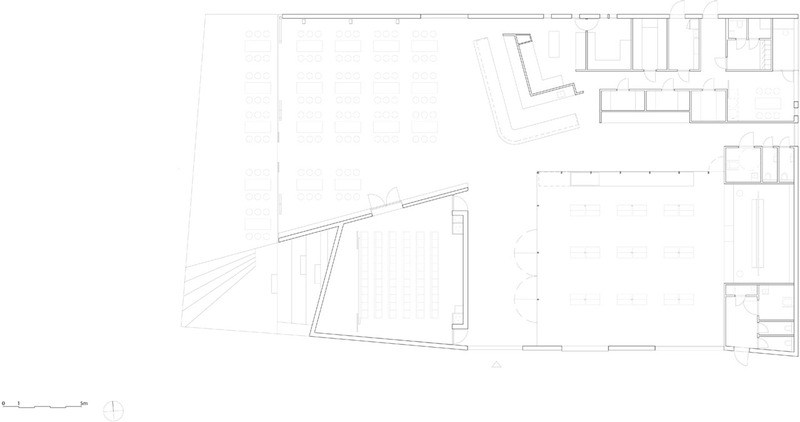 In contrast to its dramatic exterior, the interior of the tourist center is minimal, maintaining visitors’ focus on the view of the landscape. 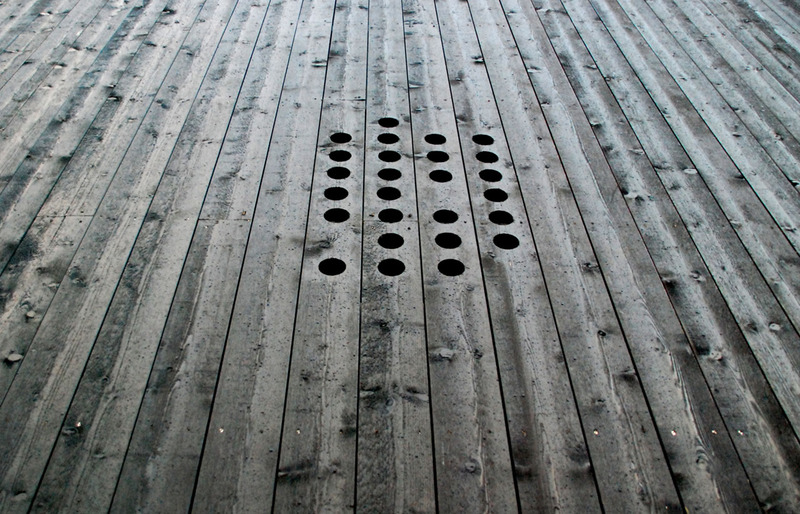 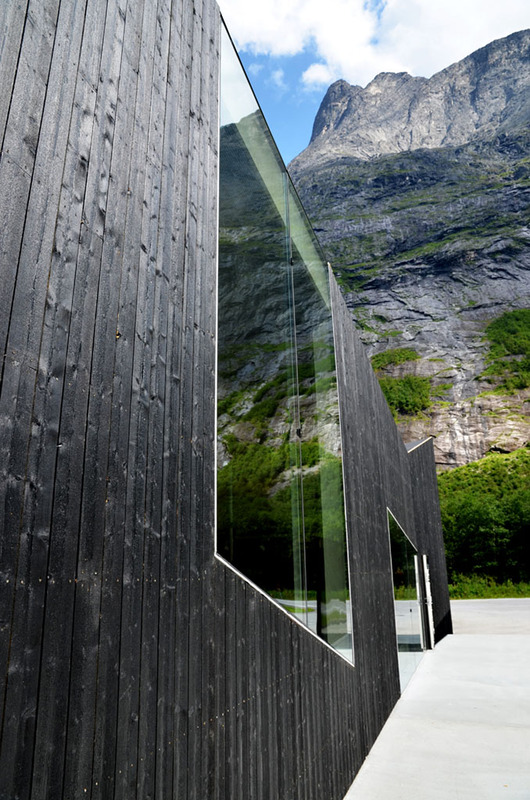 The walls form smooth, planar surfaces, and the floor is finished simply in concrete. 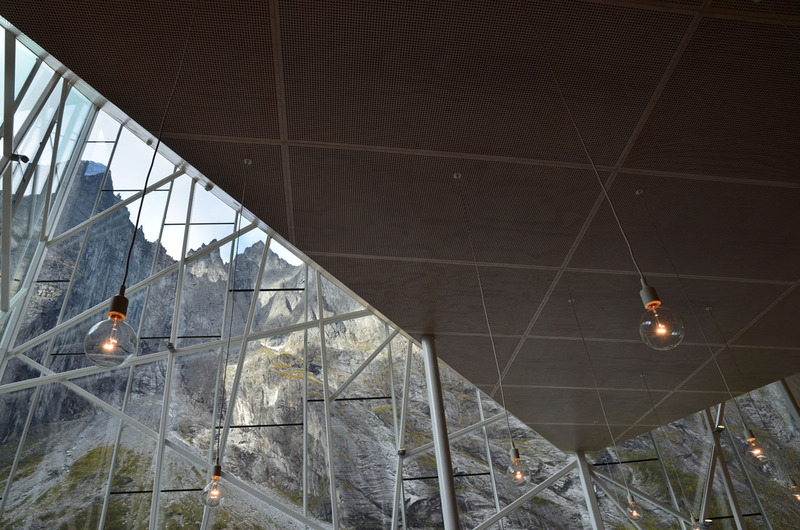 Light fixtures comprised of naked bulbs are suspended throughout the restaurant’s dining room, and minimal furnishings accentuate the space’s modern yet traditionally Norwegian aesthetic. 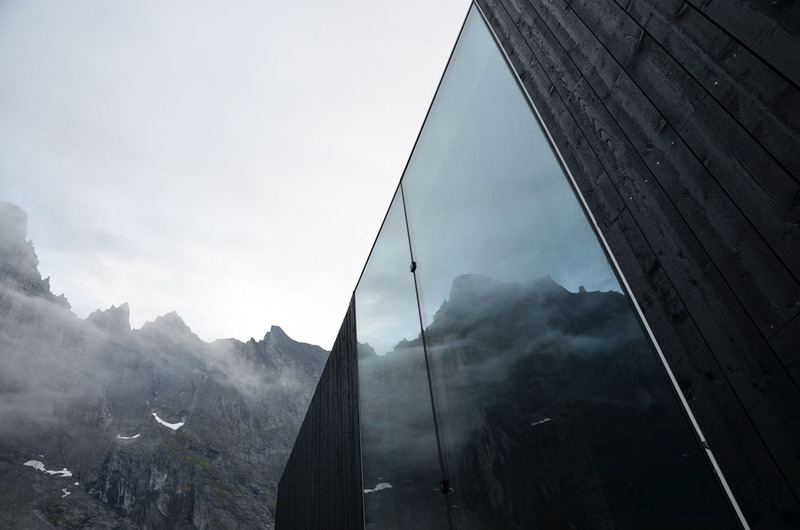 Reiulf Ramstad Architects’ portfolio is filled with projects that reflect this aesthetic, each echoing the theme of architecture that blends seamlessly with its landscape, while simultaneously serving as a modern counterpoint. 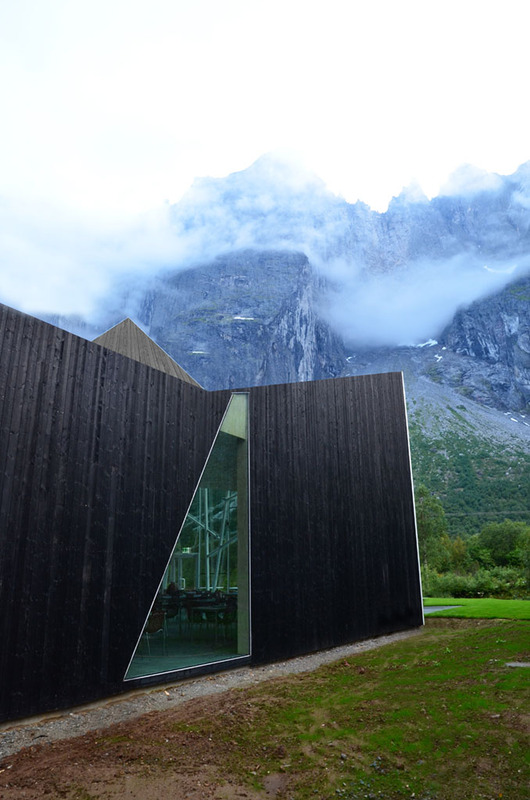 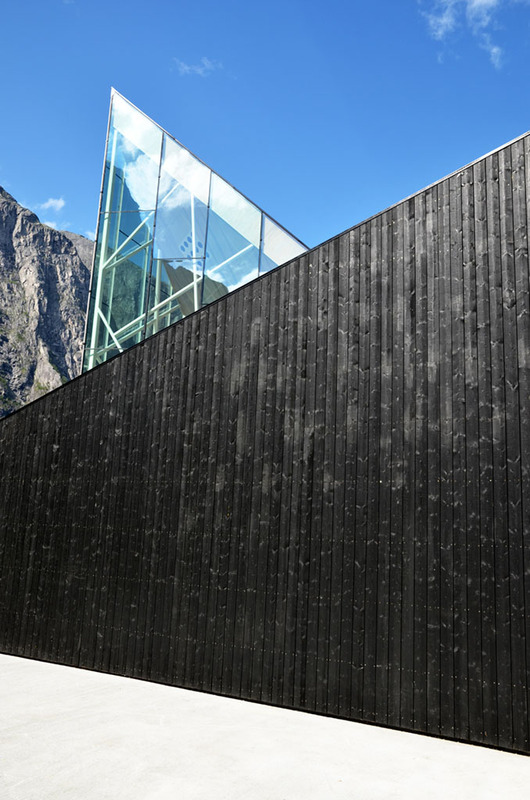 The Troll Wall center isn’t the first project of this type that they’ve designed, having completed another similar center along the Trollstigen National Tourist Route. 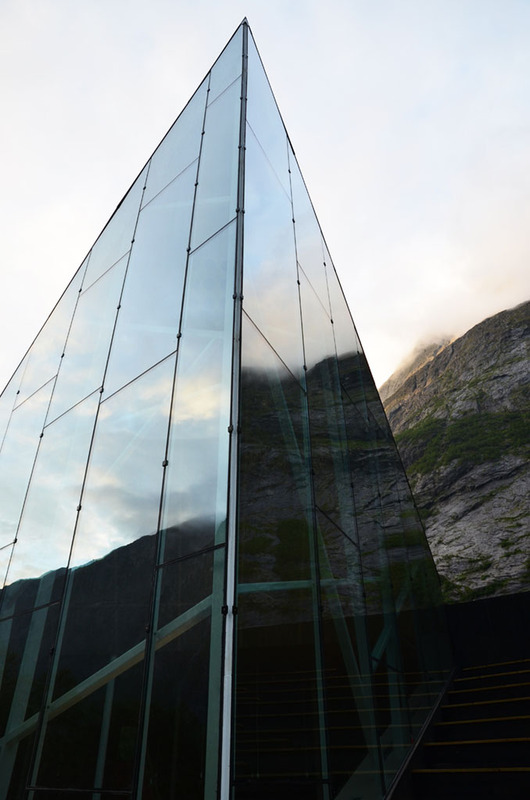 They’ve proven that the most mundane of service structures can enhance the user’s experience and even become tourist attractions in their own right.